The Imagination House in conjunction with Luminous Creative Imaging created this challenging poster for Royal Caribbean Productions. 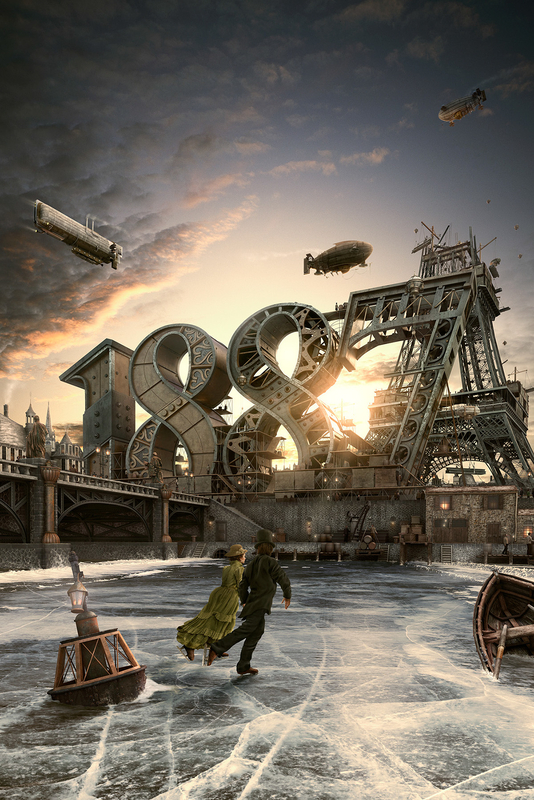 They had a 1887 steampunk styled ice show planned and needed a cool visual for their promotional poster. Together with The Imagination House we designed and sketched out the visual and all the elements in it. After this came modeling and texturing everything in 3D. Once all the elements were put together the scene was lit, rendered and was ready for post. In post many elements were added (like a sky, smoke, etc) to finish the piece. The skater couple was illustrated from scratch based on people in the 1800's and then upgraded and shaded with photographic material. Great project to have worked on and very happy with the result.